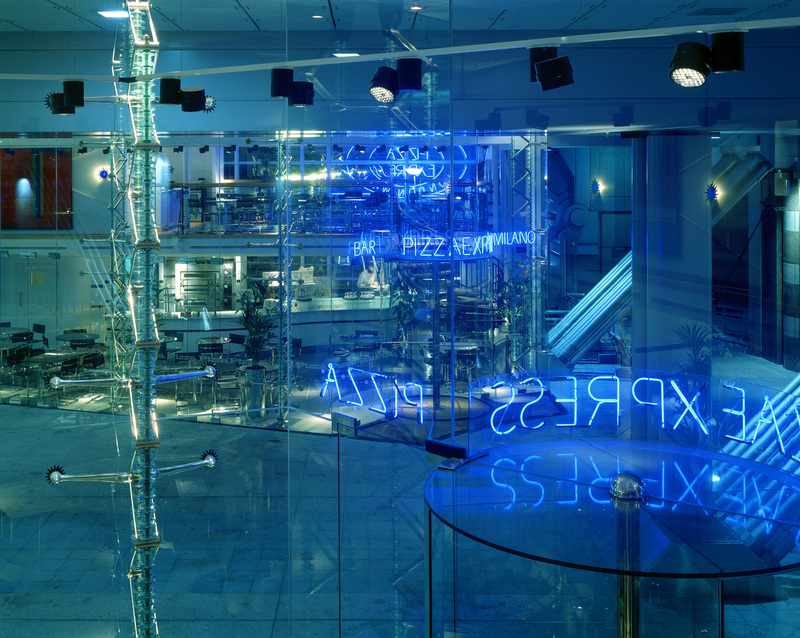 This early project to design the frameless glass facades of the Pizza Express restaurant at the Barbican was not without technical challenges. The two-storey facades had to accommodate up to 40mm movement of the existing building, and we designed a swinging arm suspension system to accommodate this, working with Campion and Partners, structural engineers. Taking advantage of what was at the time a brand-new technology of CNC metal component manufacturing, we invented an articulated glazing bolt designed to accommodate the predicted movement of the structure without localised stress to the large sheets of toughened glass. Several years before risk assessments became mandatory, we asked Arup Façade Engineering to provide a final third-party check of every detail of the design, including its ability to withstand extreme wind loads, and we provided annual maintenance instructions to the building owner. The design divided the restaurant into two self-contained units facing each other on either side of a public walkway. We developed a post-tensioned stacked-glass structural column design based on the idea of vertebrae to support the frameless glass walls that enclose the restaurant dining areas. Each truss was factory-load-tested before despatch to site. Justin Bere made all the casting patterns himself out of wood and presented them to the structural engineers to carry out engineering calculations of the shapes that had been produced intuitively, before handing the patterns over for manufacture. Every casting was sent away for military-grade forensic checks to ensure there were no hidden defects. Frameless revolving glass entrance doors were needed to match the frameless facades, but they were not available in 1996, so, with the structural engineer, we designed the frameless glass revolving doors as bespoke items right down to the detail of the mechanical bearing components. The unpatented designs were published in full detail in the 520-page authoritative text book ‘The Revolving Door since 1881’ by Alan Beardmore, published by Boon Edam, one of the oldest surviving revolving door manufacturers. By the time the book was published in 2000, Boon Edam had patented a frameless glass door and was selling it around the world.